January 21, 2014, Oakland, Calif.: Madera County almond grower Tom Rogers is the recipient of the 2014 Farm Water Steward Award jointly presented by the Pacific Institute, Community Alliance with Family Farmers (CAFF), and Ag Innovations Network at an award dinner celebration at the T.S. 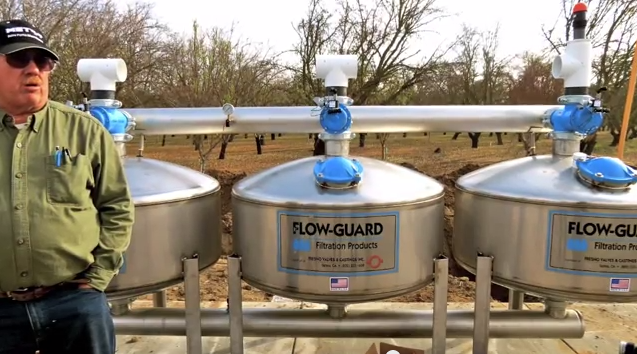 Glide Ranch in Davis, Calif. A third-generation farmer, Rogers has reduced water use by up to 20% by improving irrigation scheduling techniques – combining careful soil moisture monitoring and weather information from on-site stations to precisely determine the timing and amount of irrigation water to apply to his almond trees. By doing so, he also has improved crop yield, producing more crop per drop and improving water-use efficiency. The Farm Water Steward Award was established to recognize leaders and innovators in water stewardship across the California agricultural community. The 2014 award was presented by Gisela Wendling, director of the Water Program at Ag Innovations Network. Heather Cooley, co-director of the Water Program at the Pacific Institute, delivered welcoming remarks. Each year a Farm Water Steward Award winner is chosen from the submitted success stories on the Interactive Database of Ag Water Stewardship Case Studies launched by the Pacific Institute and California Roundtable on Water and Food Supply — which includes a video and case study on Tom Rogers’s success with smart irrigation scheduling from the Pacific Institute California Farm Water Success Stories series. The database features innovative and effective efforts of farmers like Rogers who work to improve on-farm and regional water management. “Wise use of irrigation water must be a top priority for California growers, especially with growing water supply and water quality concerns. Tom Rogers has been a leader in employing irrigation technologies and demonstrating how they can help improve on-farm water-use efficiency,” said Heather Cooley of the Pacific Institute. “His success is a great example and resource for other farmers, and we are proud to present him with the 2014 Farm Water Steward Award. An audio interview and slideshow with Farm Water Steward Award winner Tom Rogers is available at http://youtu.be/_a7KC4dprwA. Growers, water districts, and agricultural organizations are invited to submit case studies to be considered for the next Farm Water Steward Award on the Interactive Database of Ag Water Stewardship Case Studies at: www.agwaterstewards.org/index.php/case-studies. The Interactive Database of Ag Water Stewardship Case Studies is at: www.agwaterstewards.org/index.php/case-studies and the Farm Water Success Stories and more videos from the Pacific Institute are at www.pacinst.org/publication/california-farm-water-success-stories-2/.